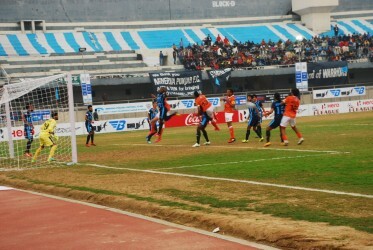 After Churchill Brothers’ shaky defence in the last match led to a 4-5 defeat at the hands of Minerva Punjab FC, their newly appointed coach Derrick Pereira will be looking to tighten up their back four when they take on DSK Shivajians in the I-League match at Tilak Maidan, Vasco on Sunday. On the other hand, DSK have experienced mixed form winning drawing and losing one each in the last three matches. Dave Rogers will be hoping to grab all three points and get his team back on track after defeat in the last match against Mohun Bagan. Churchill coach Perreira is most likely to make minor changes in the starting XI which lost against Minerva in the last match. The coach might think of bringing back Seriton Fernandes in place of Satish Singh who completely failed to impress in the last match. The Red Machines will continue to miss defender Fulganco Cardozo due to injury. We might also not see defender Rowilson Rodrigues and Richard Costa as they were not seen in the practice session due to minor injuries. DSK Shivajians have no injuries or suspensions and manager Dave Rogers has a full squad to pick from. The last meeting between the two sides ended in a 1-1 draw. That was the first meeting between them. “The positivity from the last match is that we scored four goals and we need to make fewer mistakes. We discussed a lot of things and we worked on the pitch and I’m sure we will put up a good show.” He further added. Dave Rogers-DSK Shivajians: Though Churchill Brothers are at the bottom of the table, the Spanish coach is not taking them lightly as he expects a power-packed match at Tilak tomorrow. 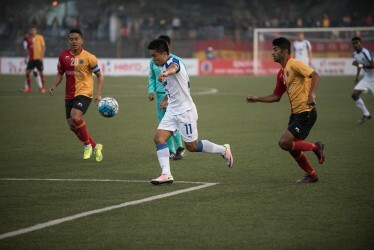 Chesterpaul Lyngdoh- Churchill Brothers SC: The winger has already proved his calibre for his side. Chesterpaul can drift to any side when needed. Though he is short in height, his physical structure makes no difference in winning the aerial duels as his high jumps to win the ball always surprise opponents. With his pace and calibre to easily dribble past defenders, he will be the man to stop for the Pune based club. 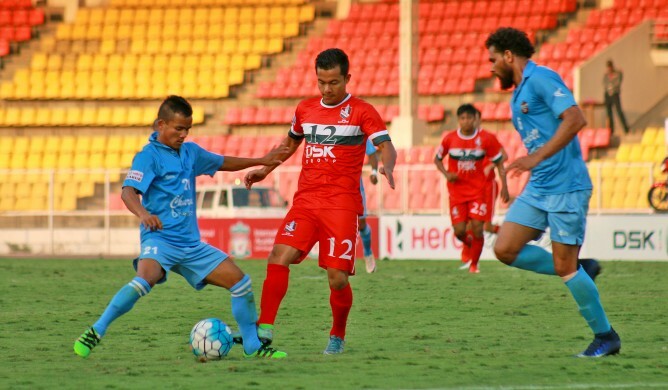 Juan Quero- DSK Shivajians: The Spanish midfielder is the creative engine of the team. Quero is excellent with the ball at his feet and always pin-point accurate with his passes. The 32-year old is also good at defence and excellent at winning the ball with clean tackles. DSK will be looking at the midfielder as a link between midfield and attack in the tomorrow’s match. Churchill Brothers: (4-4-2) Priyant (GK), Khan, Seriton, Rodrigues, Almeida, Brandon, Costa, Surchandra, Kroma, Lyngdoh (U22), Wolfe. DSK Shivjians: (4-4-2) Paul (GK), Gauramangi, Charles, Mawihmingthanga, Quero, Narzary, Lalrinzuala, Sairuatkima, Dhot, Milan, Passi. The match will be telecast live on Ten 2 from 4.35 PM. You can also follow live text commentary of the game on www.khelnow.com.